Traditional dental X-rays can capture two-dimensional (2-D or flat) views of hard tissues (bone and teeth, for example), while CBCT can image these anatomical structures with less distortion, more clarity, and unlimited perspectives of areas of interest. 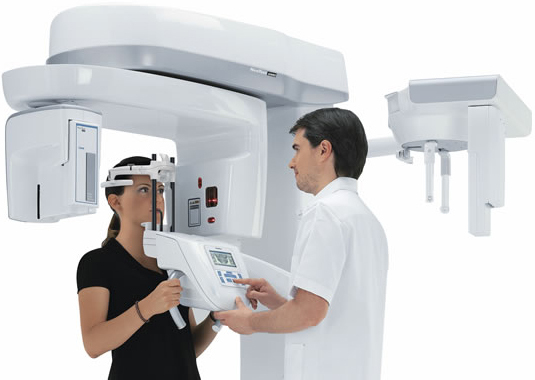 Mobile Dental CBCT Scans produces 3D, high-resolution imaging and has become a necessity and reality in dentistry. These details allow your doctor to make an accurate diagnostic and choice of treatment. - Significantly less radiation than conventional CT scans taken at hospitals and imaging centers. - Save your time, money and commute. We will come to you! Mobile 3D Imaging will travel to your dentist’s office or your home or place of business. It’s our convenience and customer-first focus that simplifies what is otherwise a prolonged, time consuming, and open ended process. Imagine the convenience of having a Mobile Dental CBCT Scan performed in our state of the art mobile platform in your driveway! From start to finish the whole appointment should take 15-30 minutes. The scan will be complete in 18-28 seconds. We use automatic dose exposure. This technology automatically adjusts the radiation dosage according to the patient's age and size. As a result, ​radiation exposure for this type of scan is minimal. It is equivalent to being outdoor for 6 days or 1/10 of a chest CT scan. The scan is only of your head and neck allowing you to stay fully clothed. You will have to remove all metal from your head and neck including metal dentures, glasses and all jewelry. Mobile Dental CBCT Scans are NOT invasive. You are positioned in a seating or standing position and the scan goes around your head for 10 to 20 seconds. It is not a tunnel machine if you are worried about claustrophobia. You should NOT be scanned if you are pregnant. Payment for scans are due at time of service. Patient is responsible for payment unless otherwise indicated by your doctor. We accept all major credit/debit cards. There is a cancellation fee unless notified 24 hours in advance. Mobile 3D Imaging is a fee for service imaging company and has not contracted with any insurance company. The company does not have a billing department allowing us to save on costs and keep our scan pricing low. The images will be sent to your doctor to be evaluated. If you wish to retain a copy for yourself, please request it at time of scan.